Presented to: By: Date: Federal Aviation Administration FAASTeam & North Florida Flight Standards District Office FAA Safety Team Safety Presentation Seminar. 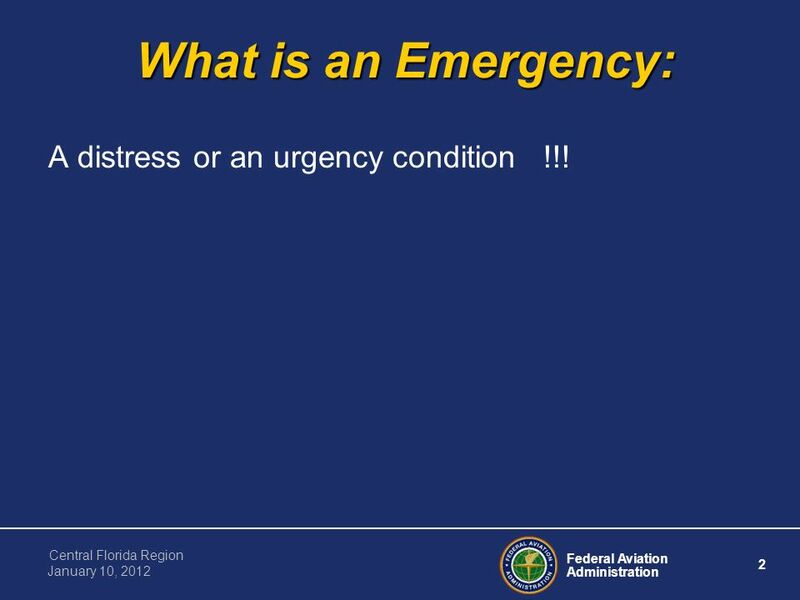 2 Federal Aviation Administration 2 Central Florida Region January 10, 2012 What is an Emergency: A distress or an urgency condition !!! 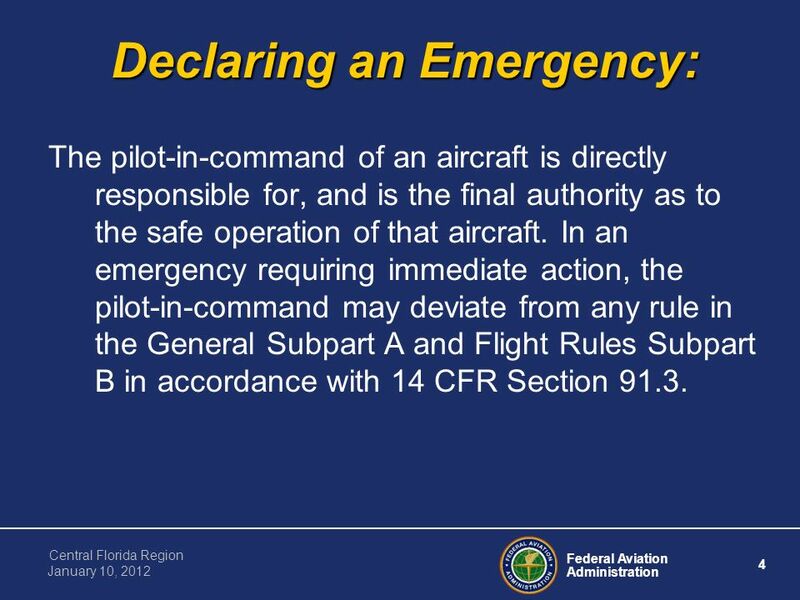 4 Federal Aviation Administration 4 Central Florida Region January 10, 2012 Declaring an Emergency: The pilot-in-command of an aircraft is directly responsible for, and is the final authority as to the safe operation of that aircraft. In an emergency requiring immediate action, the pilot-in-command may deviate from any rule in the General Subpart A and Flight Rules Subpart B in accordance with 14 CFR Section 91.3. 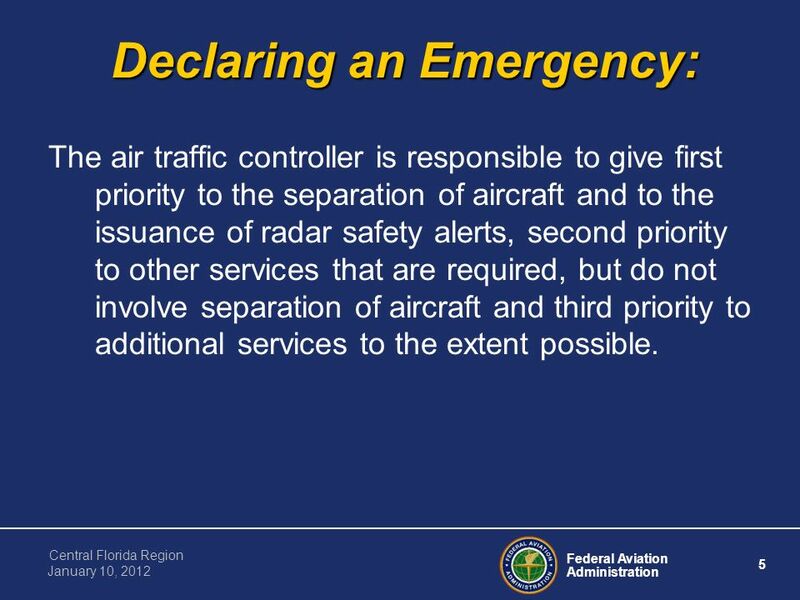 5 Federal Aviation Administration 5 Central Florida Region January 10, 2012 Declaring an Emergency: The air traffic controller is responsible to give first priority to the separation of aircraft and to the issuance of radar safety alerts, second priority to other services that are required, but do not involve separation of aircraft and third priority to additional services to the extent possible. 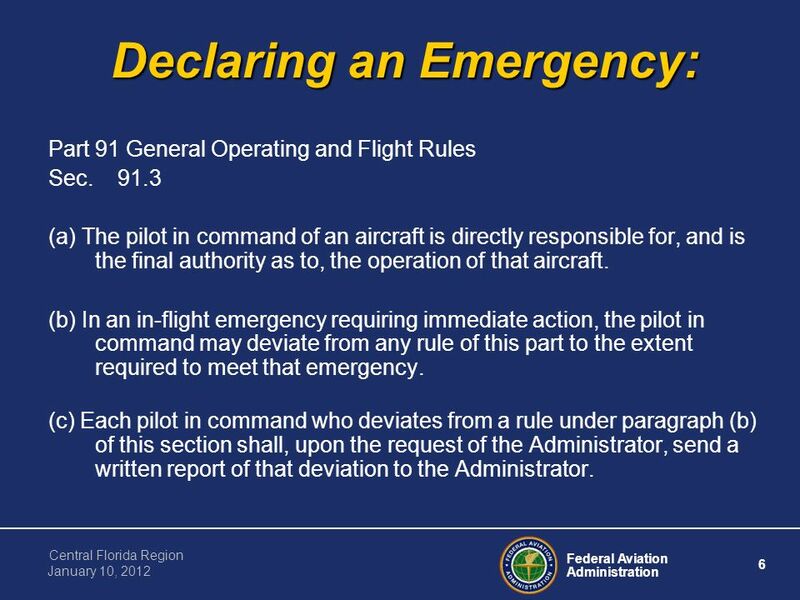 6 Federal Aviation Administration 6 Central Florida Region January 10, 2012 Declaring an Emergency: Part 91 General Operating and Flight Rules Sec. 91.3 (a) The pilot in command of an aircraft is directly responsible for, and is the final authority as to, the operation of that aircraft. (b) In an in-flight emergency requiring immediate action, the pilot in command may deviate from any rule of this part to the extent required to meet that emergency. (c) Each pilot in command who deviates from a rule under paragraph (b) of this section shall, upon the request of the Administrator, send a written report of that deviation to the Administrator. 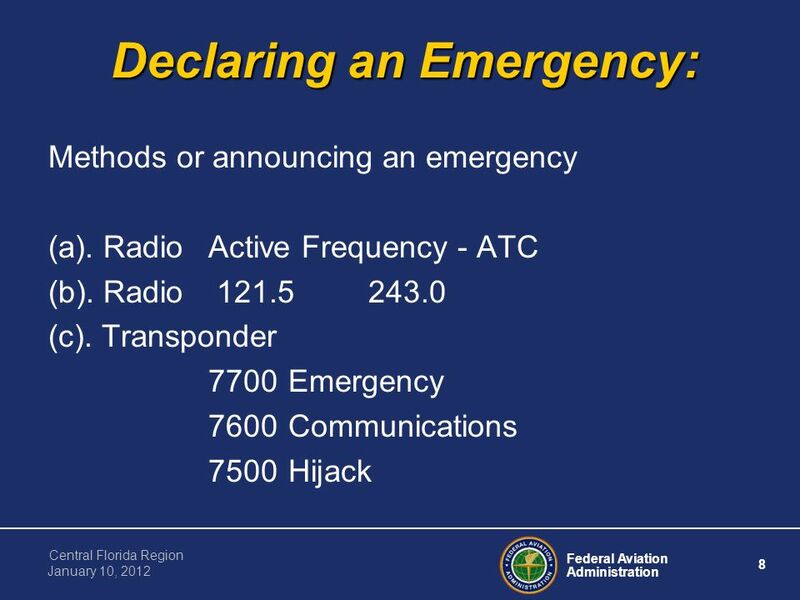 7 Federal Aviation Administration 7 Central Florida Region January 10, 2012 Declaring an Emergency: Part 7110.65 Air Traffic Organization Policy Sec. 7110.65-10-1 (a). An emergency can be either a Distress or an Urgency condition as defined in the Pilot/Controller Glossary. (b). A pilot who encounters a Distress condition should declare an emergency by beginning the initial communication with the word Mayday, preferably repeated three times. For an Urgency condition, the word Pan-Pan should be used in the same manner. (c). 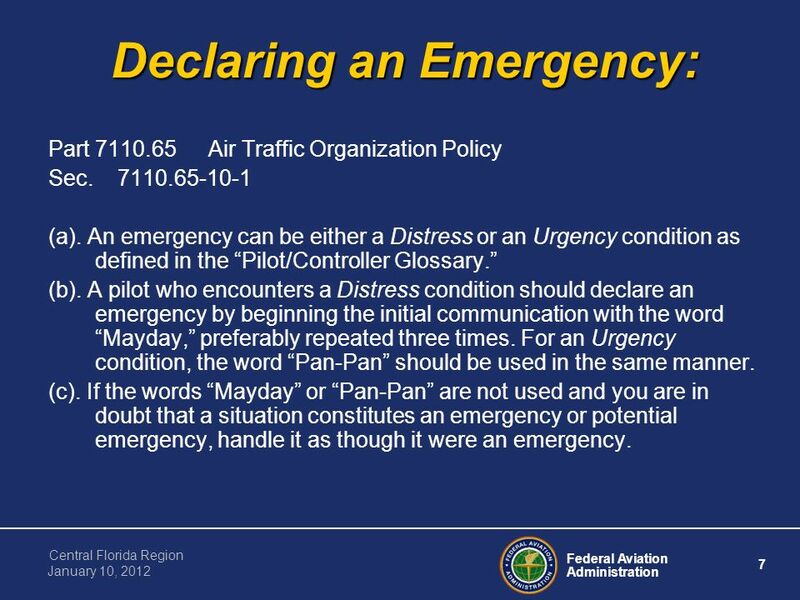 If the words Mayday or Pan-Pan are not used and you are in doubt that a situation constitutes an emergency or potential emergency, handle it as though it were an emergency. 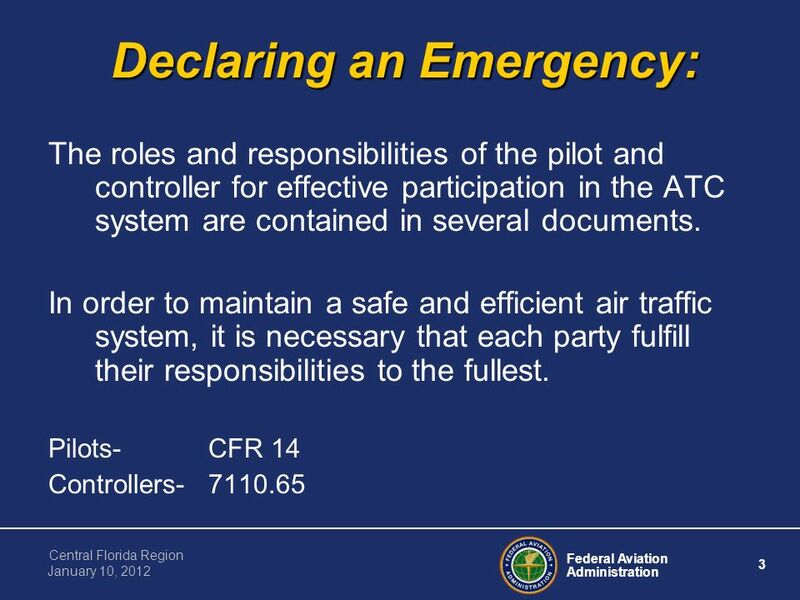 9 Federal Aviation Administration 9 Central Florida Region January 10, 2012 Declaring an Emergency: Fuel Related Emergencies: Minimum fuel (from the AIM) Indicates that an aircrafts fuel supply has reached a state where, upon reaching the destination, it can accept little or no delay. This is not an emergency situation but merely indicates an emergency situation is possible should any undue delay occur. Emergency Fuel (industry accepted definition) The point at which, in the judgment of the pilot-in-command, it is necessary to proceed directly to the airport of intended landing due to low fuel. 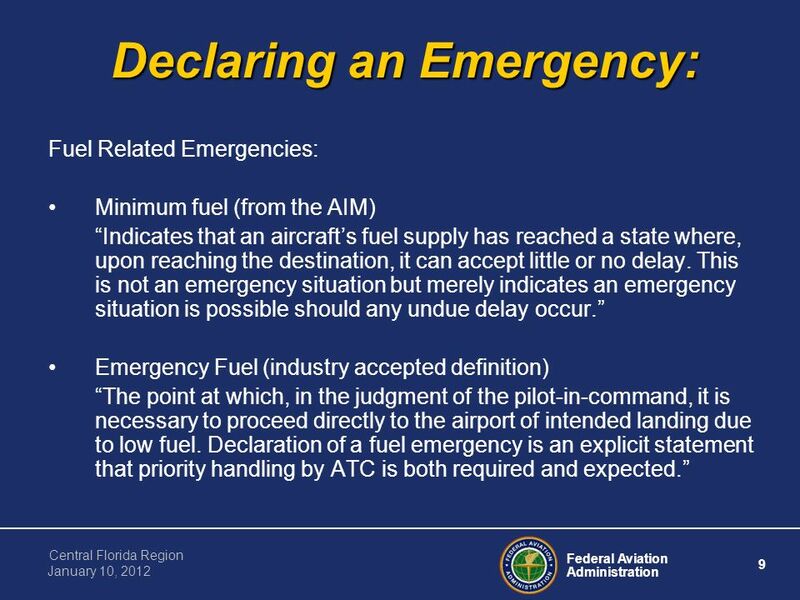 Declaration of a fuel emergency is an explicit statement that priority handling by ATC is both required and expected. 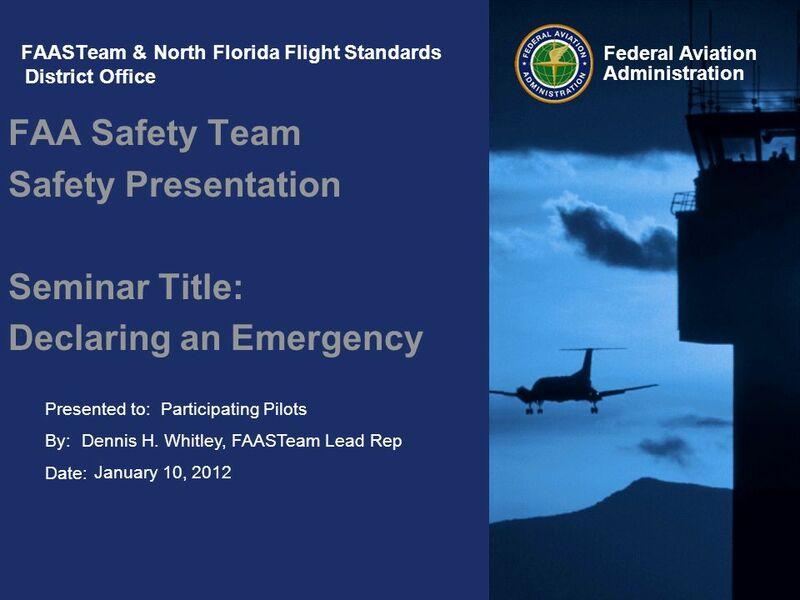 Download ppt "Presented to: By: Date: Federal Aviation Administration FAASTeam & North Florida Flight Standards District Office FAA Safety Team Safety Presentation Seminar." 1 Air Traffic Quality Assurance Program The Federal Aviation Administration Presented By: Gary D. Romero. Federal Aviation Administration 1 Collaborative Decision Making Module 2 Developing A Collaborative Framework. 1 Federal Aviation Administration FAA Academy November 21, 2011 Air Traffic Organization FAA Academy Courses Aviation System Standards November 21, 2011. Federal Aviation Administration Presented By: Dennis Addison, FAA Date: February 8, 2012 SOCM-2 Seminar Data Link Operations. Federal Aviation Administration Performance Based Communication and Surveillance (PBCS) Data Link Operational Authorization Process Date:13-14 May 2013. Federal Aviation Administration 1 35 th Annual Airports Conference – April 3, 2012 FAA Air show Waiver Reviews Presentation to: Name: Date: 35 th Annual. Presented to: The FAASTeam CFI Workshops By: The FAASTeam Date: July 2011 Federal Aviation Administration FAASTeam CFI Workshop #4 Module 4, Core Topic. Presented January 20, 2011 by: John Allen Director, Flight Standards Service (AFS-1) Federal Aviation Administration Public Aircraft Operations Forum. EMERGENCY AUTHORITY By: Alan Armstrong Copyright Alan Armstrong. All Rights Reserved. Emergencies. Recap Aircraft Maintenance Ground Handling Prep for Flight General Flying Aero’s & Formation flying Emergency procedures. Federal Aviation Administration Presented To: IPACG/39 Presented By: Dennis Addison, FAA Date: February 5-6, 2014 WP02: Timing Errors in Oakland OCA. AIRCRAFT HANDLING Part 8 Aircraft Emergencies. Presented to: By: Date: Federal Aviation Administration Noise 101: Federal Noise Laws and Regulations Town of Payson M.L. Chittick, Scottsdale FSDO January.